Life is intense right now. That isn’t to say that there aren’t still plenty of opportunities to tune out and go with the flow, but that option doesn’t seem to be working as well as it may have in the past. Stuff’s coming up to be addressed in our personal lives and in the world. This process calls for a greater capacity to be mindful and intentional. I believe it also calls for more compassion all around—for self and others. In this moment, choices, conversations, and plans for the future are charged with heightened significance. Does it feel that way to you? Astrology sure is supporting this perception. Astrologers have been affirming what many of us have been sensing: We are living in a time of heightened significance. The stakes seem higher and our choices matter more. The ongoing transit between Pluto and Uranus is a marker for this time in our human history. These two planets are the questioners. They ask us to challenge the status quo and to think deeply about how we got here. In their long cycle of about 140 years, they are coming again to the forefront of experience and evolution. (This cycle began in 1965.) It is time to pay attention, to experiment, to question, and to change. I know many people who are engaged in this process. They are re-patterning their responses to others—they are looking with new eyes at privilege, social justice, ways to make healthy choices, and ways to live in proper relationship with all beings. This is good work. We are living in a time of potent integrity and a time when extreme social injustice is still very present. How do you build capacity to be on the vanguard of change? This Aquarius lunar cycle* has given us an opportunity to look at the ingredients that help us make sustainable and healthy change. Perhaps you have also noticed how important compassion is to this process. This lunar cycle has been bookended with two significant transits from Jupiter in Cancer (encouraging heartfelt responses). Around the New Moon, Jupiter opposed Pluto; at the end of this cycle, Jupiter squares Uranus. Jupiter is one of those planets that can be a trigger for the release of built-up tensions. The trigger and the guidance come from the heart of Cancer. Issues of home, family, and nurturing are asking us to do the evolutionary work of changing reality. Another huge influence of this cycle, Mercury moving retrograde through the first part of Pisces into Aquarius, has served to help us link universal emotion with visionary thinking. The gift may be to accept what we don’t know even as we pay attention to what our hearts are telling us. 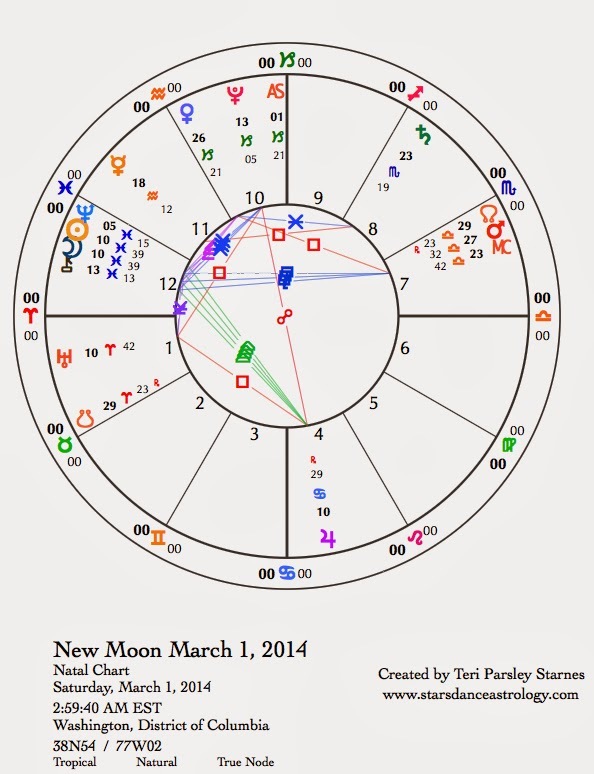 Mars turns retrograde this week on March 1, the same day as the New Moon in Pisces cycle begins. Mars stations retrograde every two years. It will appear to be moving backwards until May 19. It will not truly complete this process until July 21 when it will reach the retrograde position of March 1. In essence, this whole process began on December 26 of last year when Mars entered the retrograde zone. For these seven months, the attention of our wills and passion turn to Libra and all the issues associated with that sign. While Mars is in Libra, it will also come into triggering aspect with Pluto and Uranus. If Jupiter triggered us through the heart of home, Mars may trigger us through the structures of partnerships and the necessity for balance. Sunday, February 23. The Sun makes its yearly conjunction with Neptune today. Even though the next New Moon (in Pisces, ruled by Neptune) doesn’t occur for five more days, the softening and flowing of the Pisces lunation has already begun. Tendrils of Aquarius intention expand into oceanic connection. I love to turn to Rumi’s ecstatic poems during this Piscean season. Just about any one of them will do. But, here are a few words to inspire: From “On Buoyancy” I saw you and became empty. This emptiness, more beautiful than existence, it obliterates existence, and yet when it comes, existence thrives and creates more existence! With the Moon also making a delightful connection with Mercury, write a poem of your own. You only have to show it to yourself. Monday, February 24. We enjoy the gifts of structure and boundaries today. Sometimes, these very things chaff and confine us. Today, they are necessary grounding forces, which may help us to expand into change later this week. In fact, tomorrow may be a day of disruption and surprise, so take advantage of the Capricorn Moon (cardinal earth sign) and a helpful aspect between Venus and Saturn to find the structures and boundaries that support you. This is the third time since late fall of last year that Venus in Capricorn forms a sextile to Saturn in Scorpio. Venus has been helping us to find the form and boundaries within our relationships. Notice what you are learning about this for yourself today. February 25—Balsamic Moon: Surrendering. Paradox is the closest thing to truth I know. As we think about our visions for the world, how does paradox inform you? We may be surrendering certainty under this phase of the Moon, but what fills that space when you are able to let go of opinion, needing to be right, or expecting others to embrace your vision? Without the safety net of certainty, what possibilities emerge? The Moon in Capricorn holds the tension between attachment to past forms and maintaining the larger vision that allows us to grow. Paradox is present when we both know and don’t know what our next steps should be. Early, right after midnight CST, the Moon contacts all the planets in the tense aspect configuration of Jupiter in Cancer, Pluto in Capricorn, and Uranus in Aries. Once again, easy solutions escape us when we are confronted with big obstacles. Perhaps it is time for us to master the ninja skills of paradox. Why is life so hard? Does it have to be? What is your superpower right now? How will you dare to offer yours to the unfolding story? The aspect between Pluto and Chiron today aids the approach of transformative compassion. Pluto adds power; Chiron adds healing potential. As the Moon contacts Venus late tonight, notice the need for human relationship, for beauty, for comfort. Be gentle with yourself. Wednesday, February 26. The Moon returns to Aquarius today as we begin to bring this lunar cycle’s intention to a conclusion. What do you notice differently about vision, heart, change, and sustainability? Early this morning, Jupiter in Cancer forms a square to Uranus in Aries. We may be jolted once again into realizing that change is afoot. We get to claim what we most desire in our homes and hearths. We may notice more profoundly how these areas impact our lives. Another Rumi poem comes to mind: “The breeze at dawn has secrets to tell you. Don’t go back to sleep. You must ask for what you really want. Don’t go back to sleep.” Notice that you may have strong reactions, even anger, associated with wanting to wake up. Thursday, February 27. Mercury is stationing direct tomorrow. Right before that happens, the Moon pays a visit to the trickster planet through a conjunction today. The days surrounding Mercury stations are the most likely for those classic Mercury retrograde mix-ups in communication and travel. Because Mercury and the Moon are in Aquarius (an air sign), the potential for our minds to trip us up is even greater. There is no point in expecting perfection, but notice where you may want to bring more conscious attention to your communication. The Moon also forms a square to Saturn. This aspect may create profound disappointment around communication failures, but it can also support us in making new communication agreements. Friday, February 28. The Moon enters Pisces and we begin the process of flowing out of winter. The mutable signs (Pisces is mutable water) are the in between seasons, which occur right before we begin the next season. We are in between winter and spring. What do you need emotionally and physically right now to ease that transition? Mercury stations direct today. It is a good idea to be more patient and aware that some of us will not be as focused as we should be on things like driving or using tools and technology. This is a great day to practice compassion. The Moon is conjunct Neptune this afternoon (CST) while the Sun in watery Pisces is trine to Jupiter in watery Cancer this evening. Go with the flow. Be tender with yourself and others. March 1—New Moon: Dreaming. As I said in yesterday’s forecast, the mutable signs (like Pisces) prepare the way for the next season. The spring season, which will begin during this new lunar cycle, may bring dramatic shifts in our world. Perhaps we will notice big changes in the world of politics or perhaps we will simply notice the profound change that happens every year at this time when the hours of daylight begin to exceed the hours of night (Northern Hemisphere). This is in itself a big change, which is helped by self-care and mindful intention. Pisces is about flow. The sign encourages us to surrender and to expand into a vaster consciousness. This experience can be ecstatic and it can be disorienting. It is helpful at times to step back from the desire to merge with others and remember the boundaries of our own bodies. This is a good time to look at our eating and sleeping habits and return to the practices that encourage vitality. The Pisces lunar cycle is also a good time to attend to our emotional states. I live in a place that is covered with several feet of snow. As the snow cover melts, we begin to see the things we left in our yards emerge. These things may bring delight or panic, depending on what they are. This could be a good metaphor for what we experience in the Piscean time of melting. Surprising emotions may emerge as we melt away winter. We are not alone in this, even though it can feel that way. Holding ourselves and others with gentleness helps us make the shift. At the New Moon phase, we dream about intention for the cycle. We may not know right now what the work will be. I am inviting myself to let the work be about self-care. What about you? Even as the New Moon is encouraging flow, several planets are stationary giving a contrary experience. Things feel stuck right now. Today Mars stations retrograde in Libra. Yesterday, Mercury stationed direct in Aquarius, and tomorrow Saturn stations retrograde in Scorpio. In just five days, Jupiter in Cancer will station direct. Will/anger (Mars), communication/thought (Mercury), responsibility/structure (Saturn), and belief/opportunity (Jupiter) are standing still. We may feel more pressure and forget that it will not always be like this. Take a breath before taking extreme action. Pressure is present through the contacts between Jupiter, Uranus and Pluto in the chart for this New Moon. With Piscean sensitivity, we may want to numb out in response. There is nothing wrong with taking a break and disengaging for a while. It is all about balance and self-care. Remember the delight and gift of water as a tonic. Mars’ retrograde journey through Libra has us looking more deeply at balance and knowing when we can’t do it all. My closing words come from Rumi, again: Be melting snow. Wash yourself of yourself. A white flower grows in quietness. Let your tongue become that flower. I believe you are a wonderful teacher and look forward to learning here and there more about how the planets affect each other and everything else...I'm Libra and understand the basics of the signs, but never looked into the influence of the planets...very interesting..maybe it's time I learned more about this.